Quite a while ago, I told you about Sukin Organics being found in Watsons and that I’d purchased the Sukin Organics Hydrating Mist Toner. I never told you how I felt about it did I? Well, let’s remedy that! The Hydrating Mist Toner is an alcohol and paraben free toner that you spritz onto your face. There is a scent of fresh roses which is lovely. I love travelling with this one especially in a car on a hot afternoon. It helps keep me awake. The toner spritzes out in a very fine foam so your skin does not get too wet and it is not an aerosol can. However, although nice, I found that my skin did not cool down very much when using this mist toner. I’m not sure why? Also, it was not all that hydrating per se. If you are using this as a toner, you will need your regular moisturizer so don’t skimp on that. 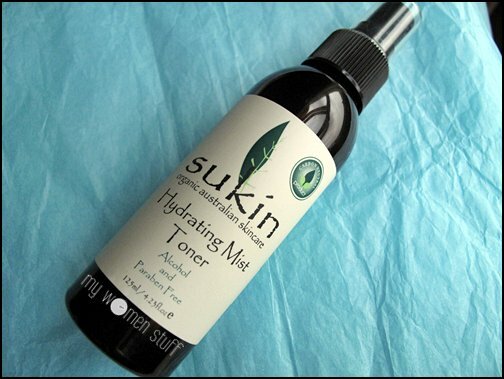 Personally, I find the Sukin Hydrating Mist Toner to be not very cooling for me on a hot day despite what it says on the label. Also, it might work great in the dry airline cabin air – but you can’t carry it on board because it comes in a 125ml bottle. Conundrum? Yes indeed! They should remedy that especially with all the in flight regulations limiting carry on liquids to 100ml bottles these days. So yes, I like the Sukin Hydrating Mist Toner for the lovely relaxing scent and for its soothing mist. But it does not quite cool me down as well as my thermal water sprays do. And believe me, in the current dry hot weather, I need cooling down! 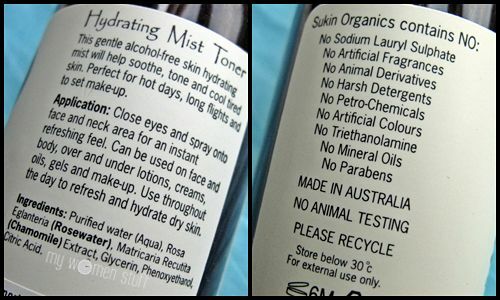 A 125ml bottle of Sukin Organics Hydrating Mist Toner retails for RM34.90. I bought mine at Watson’s Gurney Plaza but I reckon they are in most major Watson’s stores. I’m having a crappy day. I want to just go home, draw the curtains against the sun and heat and world and drown myself in this facial mist. But I can’t because I have to earn my keep. Sigh. I hope you are having a better day than I am. OOO… I’ve never tried these sprays before… But I’m scared that they may cause allergies, or trigger eczema on my face.. wuwu. The only reason I might be buying this one is because of the rose scent. I am loving my Vichy thermal spray and it has been performing quite well in cooling down my skin temperature. I have at least 3 bottles of sprays in my stash. But I don’t use them. hehehe…lazy. aww… now’s a good time to take it out – its so hot! Don’t die – just go shopping LOL… next summer you know what to pick up!